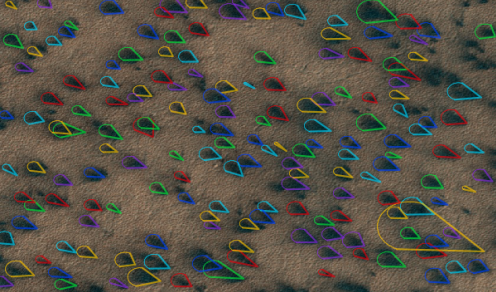 This is the single image with the most marked features from Planet Four. The “fans” show that the wind direction was towards the upper left of the frame. The Planet Four research team have recently written a paper based on the work of the ~80,000 volunteers who have contributed to the project. Together they identified almost half a million features on the south polar Martian surface. These volunteer annotations have allowed to researchers to map the surface winds on Mars in unprecedented detail. Find out more by reading the pre-print of the paper at https://arxiv.org/abs/1803.10341.